One of the best parts about conventions, big or small, is the opportunity to meet creators face to face. You can step right up to illustrators, writers, and letterers. They will be thrilled to meet you and talk, and you will be the richer for it. The artist alley's and small press areas are trading ships, loaded with spices and silks, and ready to be taken for a prize. 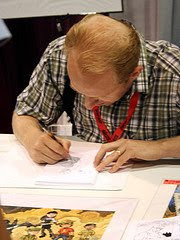 It was among the small press tables at San Diego Comic-Con that I first met Travis Hanson, illustrator and storyteller, in person and really discovered his art and stories. His illustrations buzz with life, and their depth beckons viewers to step inside. His words make the reader never want to go back. Because of this strong work ethic, The Bean and Hanson are moving forward, not always the easiest thing to do for a webcomic. The story and the artist are both gaining loyal fans. Go glance at just a handful of the panels, and you'll become one. You can't help but get lost in the images and the tale being spun before you. It's a story of a boy with an uncertain destiny in a world where nothing is what it appears to be. Know that the story has been with Travis for a while, and he has plenty of panels and inking ahead. Travis updates The Bean on Tuesdays and Thursdays. Keep up over at his website. Browse his prints while you are there, buy a paper issue of The Bean, and visit his wonderful imagination. Thus you enter the rich world of the Broken Moon in The Bean, Issue #1 – Riddles and Shrooms. Illustrator and storyteller Travis Hanson lures you into the pages. You soon meet Bean and the characters of the Silver Dagger inn. 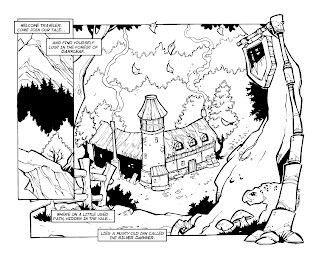 The ogre owned and operated inn is far off the beaten path in the forest of Dark Leaf. Bean was abandoned by his father (as far as the reader knows) and left in the care of the grumpy ogre Gort. He does whatever tasks Gort and the staff give him, from washing dishes to heading out into the Dark Leaf for stew ingredients. Sometimes it gets him into more trouble than any boy needs, but fear of an ogre is plenty motivation. One has to be cautious when stepping out into the dark forest though. You never know who or what is watching your footsteps. Issue #1 of The Bean has only one problem. It easy to read through too fast. You can't help but devour the story just to find out what happens next. Even though you just met them, the characters feel like old friends. Everyone knows of a dive bar that is similar to the Silver Dagger. Well, without the ogres anyway. Or maybe with. You suddenly find yourself at the end, not realizing how fast you've flown through. Make sure you take the time to go back and look at each panel. You'll find new details every time, in the background, in the clothing, you'll be looking again and again. The illustrations are rich and add volumes to the words of the story. And the landscape format leaves plenty of room for embellishment. This world has a lot to explore, and it will be exciting to follow Bean on his adventures. Visit the BeanLeaf Press store to purchase your copies now.